You concentrate on your face, but truth is, your hands can be the first places to show age. 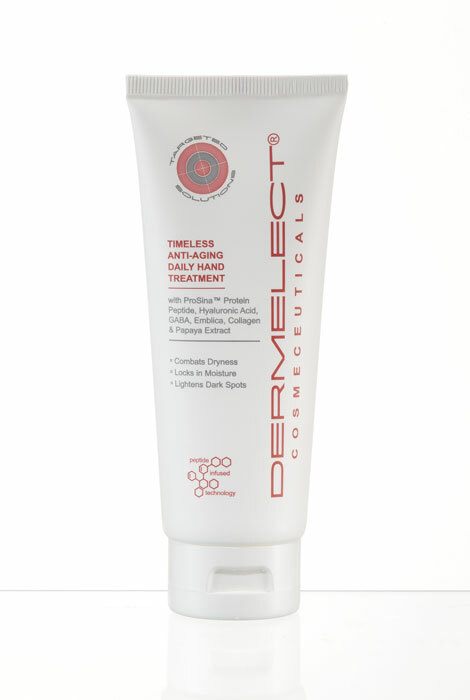 This breakthrough Dermelect® timeless anti-aging hand treatment restores youthful appearance to hands—delivering deep hydration, locking in moisture, plumping thin skin and lightening dark spots. The key players here are ProSina™, a protein-peptide delivering unprecedented conditioning and moisture, hyaluronic acid to combat dryness, emblica to lighten dark spots, papaya to exfoliate, GABA and collagen to plump thin skin. Never greasy or sticky, the luxurious anti aging treatment improves skin tone and resiliency, providing instant relief from dry, chapped hands, and keeping your age your business. Paraben and hydroquinone free. 4.0 fl. oz. I regularly use other Dermelect products with confidence.